There are signs and portents everywhere in life if you just keep your eyes open and know where to look—eldritch harbingers that presage the terror of days to come. Just such an omen arrived yesterday when an email was slipped over the transom at MacUser HQ from Axiotron, makers of the ModBook, announcing that a shadowy figure had silently glided onto the company’s board of advisors on a pair of electrically-powered wheels. 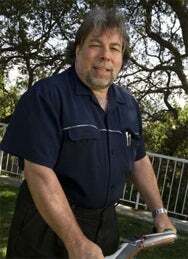 Yes, none other than Steve Wozniak—Apple co-founder and destroyer of worlds—will be parking his Segway at Axiotron HQ. If you’re not familiar with the ModBook, it’s a tablet Mac created out of a modified MacBook. The company also lets you turn your own MacBook into a tablet if you prefer. Personally, we can think of nobody better suited to champion a geeky niche Apple product like the ModBook than the original Apple niche geek himself. With Woz’s backing, the ModBook will be outselling the Newton in no time, inevitably paving the way for a touchscreen Apple II.